PAIR O DOCS is a grandson of the legendary champion SECRETARIAT. He ran and lost 3 races before his race track career was ended. All we know of him is, at some point along the way during his journey from the track, he was used as a “pack horse” on a ride through the mountains. He slipped off the trail and rolled down a 300-foot embankment through some branches and other brush. 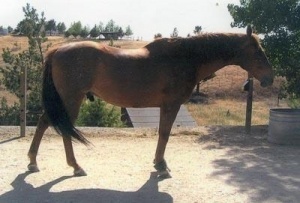 Because of a rearing problem he has had for many years, he has had numerous owners and is considered not safe to ride. He will spend the rest of his life at Heaven Can Wait.